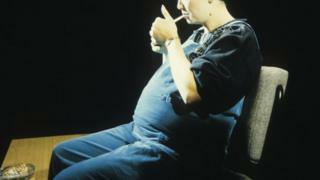 Fewer women are smoking while pregnant in England, data published by the Health and Social Care Information Centre suggests. The number of women smoking during pregnancy across England is down to 12%, the figures for 2013-14 show. Rates have fallen 16% since they were first measured in 2006-07. The government has set a target to reduce the rate to 11% or fewer women smoking at the time of delivery by 2015. BBC News website readers have spoken of the shifting perception regarding the issue, from the lack of concern still prevalent during the 1970s to the increased research and the public education of today. Yes I smoked during my pregnancies in the 1970s. We all did. We even smoked on the wards next to the babies. There was no change in perception. Even in the doctor's waiting room you could smoke. It was only visitors who couldn't smoke. That was one concession. My eight-year-old granddaughter said to me: "I don't want you to die; please stop smoking." I was impressed by the psychology, through her education. I was going to admonish this child, tell her I pay my taxes and it's my choice, but I thought I would try stopping, knowing I wouldn't give up. But, with the help of the doctor's surgery, Champix (a drug to help people quit) and the NHS Stop Smoking app, it worked. I had three children - in 1973, 1975 and 1976. I didn't smoke with the middle child, I couldn't stand the smell. The middle one was a much heavier birthweight. I used to smoke between five and 10 a day, then got pregnant and stopped. I found out I was pregnant in 2007 and just threw the pack in the bin. I had a little boy in 2008. My husband smoked. He gave up at the same time. He's never gone back, he's been very supportive. I think I had probably been looking for a reason to give up. I don't think I could have ever forgiven myself if something was wrong with the baby. It was difficult in the first few weeks, but as time went on it was quite easy. You just get on with it. I started smoking when I was at school. I was probably quite a heavy smoker, especially when drinking with friends. Unfortunately, I took up smoking again about six months after my little boy was born, but not as many. I started again when I was out drinking with friends, then, in a very stressful time in my life, having two or three cigarettes a day. I haven't had one for the last six months. The taste, the smell and the cost, all gross. I smoked for more than 20 years; it terrifies me to think what damage I have done already. I'm a born-again non-smoker. Medical specialists link so many problems to smoking yet my circumstances are very much the opposite. At 19 I gave birth to my first daughter who was born completely healthy at 6lb 14oz. I smoked all the way through with her and so far this has continued to be the case. At 23 I gave birth to my second daughter at 6lb 10oz. I had quit smoking during about 12 weeks into the pregnancy. She was born with meningitis and also suffers with chest problems. I very quickly became pregnant again with her twin sisters (second daughter was only eight months old when the twins were born). I completely quit smoking from the beginning but went into labour at 30 weeks gestation due to a ruptured placenta. Unfortunately, both twins died at nine and 14 days old with meningitis. At the age of 25. I gave birth to my final daughter. Completely off cigarettes, she was born at 6lb 5 oz. and practically lives in doctors and hospitals with ear, throat and chest infections. A friend of mine is now pregnant and she has been encouraged to cut down rather than quit smoking altogether.